NATO is coming to Washington, DC this April to celebrate its 70th birthday. We're throwing a peace fest to unwelcome the arrival of the largest military alliance in the world. 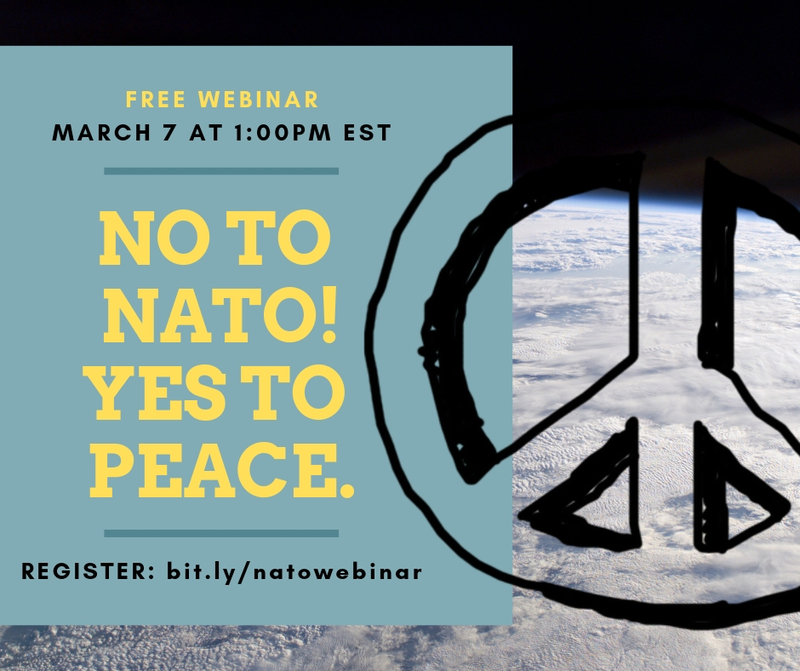 As we gear up for the No to NATO - Yes to Peace Fest, join us on March 7 for a free webinar about why we should be opposing NATO. The mainstream media is painting a false picture that NATO is a peaceful organization - but we know that it has repeatedly violated international law, and bombed Bosnia and Herzegovina, Kosovo, Serbia, Afghanistan, Pakistan, and Libya. NATO now accounts for three-quarters of all military spending and weapons dealing on the globe. Ana Maria Gower is a Serbian-British mixed media artist and a survivor of the NATO bombings of Yugoslavia and its capital - Belgrade. Being a 10-year-old in a war zone, she witnessed the destruction caused by NATO involvement both during the conflict and for years after. Her art - which will be on display at the April 3 No to NATO - Yes to Peace Fest in DC - focuses on the themes of memories, life path, and experiences of war. Jovanni Reyes is the member coordinator of About Face: Veterans Against the War. He enlisted in the United States Army in 1993 and deployed to the Balkans in 1996 as part of NATO's first ever military intervention, which culminated in the dismemberment of Yugoslavia into six statelets. By 2002, he was no longer moved by the pretexts and false narratives cheerleading for war. He resigned from the military in 2007 and began to work for peace. Kristine Karch is the Co-Chair of the No to War/No to NATO Network, based in Europe. She dedicates her life to raising awareness about the destructive and violent social and ecological impacts of NATO, and the EU's cooperation with it. She has organized numerous No to NATO panels, counter-summits, and demonstrations. The webinar will be hosted on Zoom and livestreamed via Youtube. Participants can join via computer with an internet connection, or via telephone. Once you register, you will receive an email with the livestream link and call-in information.